Aberdeen Harbour, a Trust Port, is one of the UK’s most active ports and is of international importance. The port has an annual turnover of around £30 million, of which around half is derived from supporting oil and gas operations within the UKCS, with additional income from general cargo activities, property rentals and storage. 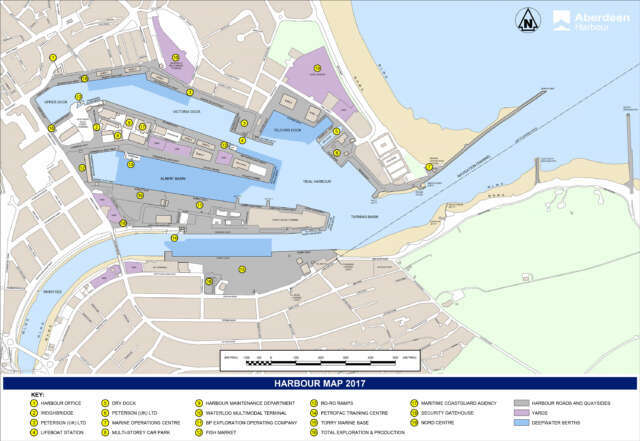 Aberdeen Harbour is a world class port, annually handling around 6,500 vessel arrivals and around four million tonnes of cargo, valued at approximately £1.5 billion, for a wide range of industries. The Port also handles a wide range of bulk, forest products, grains and mineral cargoes. The Port is ready and capable to serve the various requirements of the offshore Decommissioning Market, providing dedicated facilities for projects large and small. 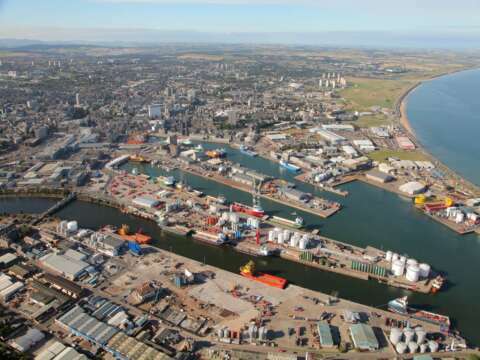 Aberdeen Harbour is the most comprehensive port providing every single aspect of service requirement for the offshore oil and gas sector, decommissioning, offshore energy and cruise activity. The harbour provides alongside direct piped fuels, muds, waste, cements, bulks, minerals, water. The harbour has extensive tankage which accommodates fuels, bulks and wastes. Local Tenants / Operators have SPMTS, Heavy Mobile Cranes, NORM handling capability, waste and scrap management services, supported by direct rail connection into the Harbour and pipeline culverts to facilitate expansion of facilities. Crew Transfer Vessels, towage and (Platform Supply Vessels) PSV support and ship repair facilities/ dry dock are all available. Aberdeen Harbour Board have commenced construction of Aberdeen South Harbour, in Nigg Bay, which are new facilities which will transform the port’s ability to accommodate larger vessels. The development would provide an additional 1,400 metres of quay, a water depth of up to 10.5m , a wide entrance and 300m turning circle, and a laydown area of more than 125,000 square metres. It would also have heavy lift capabilities, fully serviced berths and independent project areas.